On the left is a dynamic image of Winnie-the-Pooh. It is very cute and fascinating, isn't it? This kind of image format is called animated GIF, acronym of Graphics Interchange Format. We could use this color image format of small size for our SNS, twitter, facebook or apps on mobile phone to upload files. Though Website version of SNS, blog, microblog and others can relatively easily upload videos, it takes quite a long time and much network traffic for a successful uploading. What's more, when it comes to apps on mobile phone, uploading a video to SNS becomes a huge or impossible project. Animated GIF which has much smaller size than videos and needs less network traffic makes it more convenient and possible for even uploading a video on your mobile phone. What you need to do then is to compress videos to animated GIF without degrading the visual quality. Therefore, a converter which can convert videos to animated GIF format is needed. 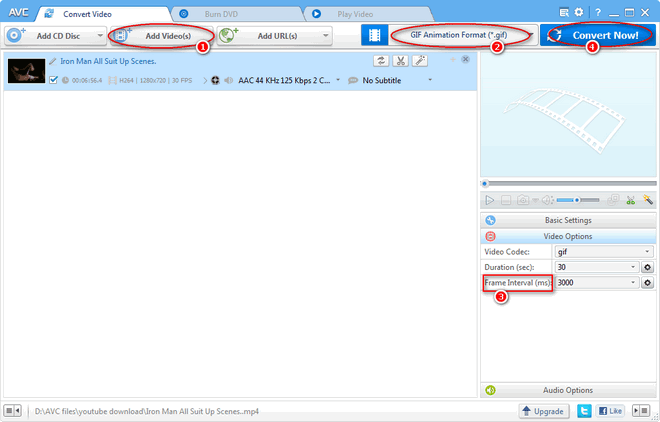 Any Video Converter is the free converter to do this job. This Video to Animated GIF Converter supports various input format and needs very simple steps to make a animated GIF file out of a video. Those who used to get problems on uploading videos to SNS, blog, and others, do not need to worry anymore since Video to Animated GIF Converter has solved the problem and makes sharing videos on the Internet very convenient and a happy experience. Download Video to Animated GIF Converter to convert videos to animated GIF Now! Please download and install this free Animated GIF Converter before you convert videos to GIF. * Supports: Up to 8 bits per pixel for each image, and a separate palette of up to 256 colors for each frame. * Well-suited for: Being uploaded to SNS, micro blog, blog and other apps on mobile phones like Apple, Samsung, Sony, Google phone and so on. How to Convert videos to animated GIF with Video to Animated GIF Converter ? Download and install this Video to Animated GIF Converter of no spyware or malware on your computer. Then launch it to do converting. Drag the videos from computer or add the video by clicking Add Video(s) button to the main window of Video to Animated GIF Converter. Generally, the program supports almost all video formats. You can check HERE to see if your video format can be supported. Go to upper right window of the program and Click "Select output profile" to choose from the drop-down list GIF Animation Format as the output profile. Then in the below window find Video Options to select Frame Interval which determines the playing speed of converted animated GIF file. Click "Convert Now !" to convert your videos to GIF Animation Format. See what has been got below: An amazing animated GIF image of small size but good quality made out of a video ! After you followed the above instruction to convert the video to GIF, the next step is to transfer the converted animated GIF file to your phone like iPhone/iPad/iPod/Android which will be specifically introduced here. You may add the file to iTunes and then sync your iOS devices with iTunes. A simpler way will be introduced here. That is to transfer aniamted GIF to iOS devices with Syncios iOS manager. You need just connect your iOS devices to computer and launch Syncios to sync iOS devices with. Click Import on Syncios to directly the GIF file from computer to iOS devices. More details about Syncios iOS manager, please click the right image. Just free download this Video to GIF Converter and try it right now!